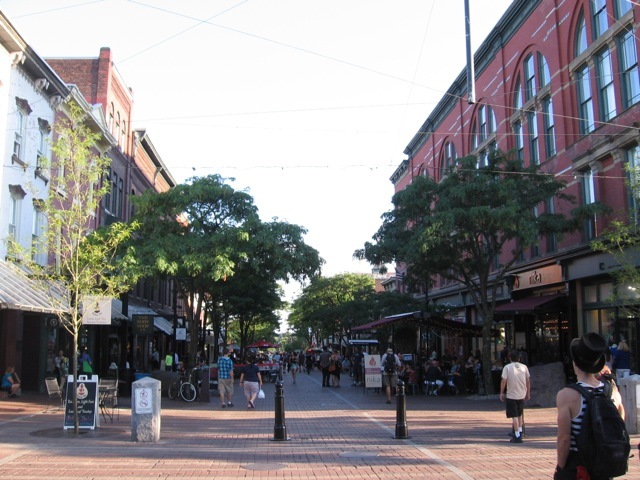 We last visited Burlington, Vermont in 2008. It was practically a drive by encounter, as we spent only one night. It was also not a proper encounter as we arrived after a long day of touring and hung out in South Burlington at a hotel along a strip. This most recent visit was not long enough either, but its length was based on the assumption that the city was likely too far north as a serious candidate for our retirement. It was more of a way station on the way to Lake Placid, New York in the Adirondacks where we are at tonight and plan to finish our vacation. Still, if we were heading that way it made sense to see the city and check out a few potential retirement areas. Unlike Northampton, Massachusetts you can find condominiums here that are actual condominiums instead of houses remodeled and subdivided into legal entities called condominiums. It took some in-depth Google searching to find them. For the most part, Burlington is like Northampton and is overrun with single family houses. Burlington is growing, however, and it is stimulating demand for something more than apartments, so you are seeing townhouse communities here and there and even the occasional condominium community. One of these was a place called Eastwood Commons. It sits in South Burlington off a main drag, next to a senior living center and block of apartments, all obviously part of a project by the same developer. All the units looked reasonably new: a few years old at most. Unfortunately, all you could really do was look at it from the outside and watch people going in and out of the building, which included lots of families with children. You needed an access card to actually get into the building and there was no office to go to for more information, as the condominiums had all been sold. No matter, they weren’t quite what we were looking for, although you could walk to strip malls instead of drive there, which was at least different. There are also condominiums of the sort we saw in Ithaca at the start of our vacation: basically two single family houses stuck together along one wall. What made them condominiums was they were all virtually identical right down to the same bland vinyl siding and two car garages. They looked relatively new as well. Surprisingly, these were not unacceptable, as they had a lot of space and something of a view of Lake Champlain in the distance. Presumably the condo association worried about things like mowing the grass and plowing your driveway. You can see them on Google Maps here. The condos that interested me from afar were The Cascades in Winooski Falls. Winooski Falls sits on the north side of Burlington, and these condos, or at least seventy percent of them, have at least some view of the falls at Winooski as well, as they are right next to them. This whole area was purchased by a developer. Like the project in South Burlington, it includes a variety of tightly coupled communities. The condos sit across the street from an upscale apartment complex, and behind them was housing designed for students at the nearby University of Vermont, also by the same developer. The street level has retail that caters to local residents. If the goal is to integrate a new more urban-like community into an old one, it’s a work still in progress. In fact, a second building of condos is going up near the first building, but nearby old Winooski Falls does not seem ready to turn make itself look historic, and seems perhaps a bit shabby. Still, Winooski Falls and Burlington in general has a certain charm. In many ways it felt a lot like Ithaca, both big college towns, but Burlington is actually the larger city. Downtown Burlington seemed much larger and cosmopolitan than I expected. It is no Boston, but it has aged in a good way and now contains a street mall that looks very similar to the Pearl Street Mall in Boulder, Colorado. In fact, part of the mall is on Pearl Street. It’s called the Church Street Marketplace and it seems to be more of a happening a place than the nearby indoor shopping mall. Parking is problematic, as in both Northampton and Boulder, but there are plenty of restaurants and eclectic shops to enjoy if that takes your fancy. 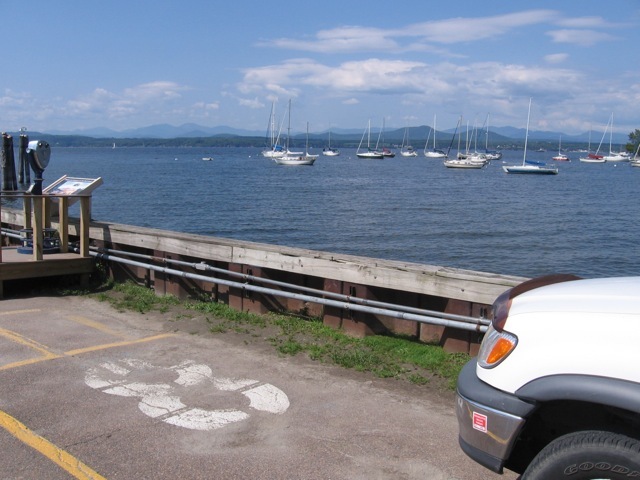 Burlington is overall quite charming, and it is not hard to find views of Lake Champlain, which acts as the bottom of a picture frame to the blue green Adirondack Mountains of New York State. The view is quite stunning compared to what we usually get in the lower forty-eight, and makes it quite unique among American cities. Burlington itself seems to have colored up since our 2008 visit. The city is a State Department host city for refugees, so Asians and Africans are moving into this cold but lovely area of the country. The coloring up is a work in progress, but encouraging. As in Ithaca, the University of Vermont is also a large anchor, bringing in educated people that disproportionately enrich the community both financially and intellectually. Still, this is Burlington, and it is so far north that it is just ninety minutes by car from Montreal. It is in the continental United States, but just barely. It feels much further out because aside from Montreal there is no other city of appreciable size within hours of it. And it is in the Snow Belt, an asset if you are a skier, but to most of the lower forty-eight, some place to visit for a brief time but not to live. Its snow is measured in feet every winter and it can spend weeks at subzero temperatures. So the land is cheap and the cost of living is in general reasonably cheap too. Our survey of housing prices suggests overall real estate is about a third less than in Northampton. Our house in Northern Virginia could probably be purchased for about $200,000 in Burlington. One other downside for us: the state will tax my federal pension, unlike Massachusetts and New York State. Unlike Northampton and vicinity, Burlington feels more like the rest of America in that strip malls and fast food are easier to find, open space is merely undeveloped space, and it is more commercialized in general. In my mind this makes Northampton more desirable overall. Still, we haven’t canceled Burlington off our list of possible locations to retire as a result of this visit. Burlington, like Ithaca and Northampton will require more thought and study as we weigh the pros and cons of each area. One thing is clear about Burlington: it is a beautiful area to live, particularly during the summer months. The Queen Anne’s Lace surrounds the edges of highways and streets in these summer months. Healthy deciduous and coniferous trees abound, the grass is intensely green and the frame of Lake Champlain and the nearby Adirondack Mountains always makes you feel somewhere special and magical. And summer tends to be delightful, instead of something to endure like we have in Northern Virginia. Couple this with Burlington itself, a clean and modern small-scale city with a university anchor and a lively downtown and you have a largely unspoiled and inviting community. As a bonus, it is continuously infused with clean and healthy air streaming off the lake and filtered by the Adirondack Mountains. Anyone interested in living in northern climates would be a fool to scratch the Burlington area off their list. It’s most definitely worth a visit.